This capability represents how the value chain can cope with feet fitting. It is to create ideal graduations of the scale where points correspond to major effort in this view. Conventionally this capability only considers how the shoe fits the feet geometry. The influence of this feature on the capability to satisfy fitting is so high that it is possible to omit other shoe elements like Thermal and Transpiration that marginally affect fitting. For instance the capability to satisfy fitting is very low for a system where the buyer shoe size from a standard set of grading (first level). If the customer finds the right size with a perfect Fit the comfort will be very high in spite of a low level of this capability. 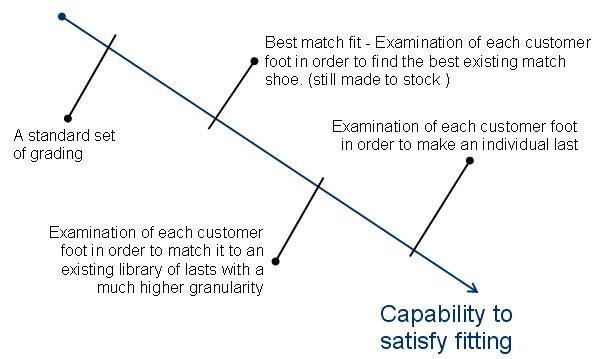 Another system that is based on made to stock but with an higher capability consists in finding the right shoe from existing shoes after an examination of each customer foot (second level). A system that uses a foot examination in order to match it to an existing library of lasts with a much higher granularity, has a better capability to satisfy fitting (third level). However the production of the shoe will require a very high effort in the whole system because the shoe is made on demand. The maximum level (fourth level) is reached with the examination of each customer foot in order to make an individual last. The effort to pass from the previous system to this one is not so high because both systems need a shoe made on demand. However it is possible that the highest capability system could make an uncomfortable shoe for the customer because comfort is a personal feeling which is not linked to the production method. Indeed some people may prefer the shoe to really tighten the foot while other may prefer it to be looser. It’s important to note that this capability has a high impact on the buyer needs and customer satisfaction. The comfort is one of the main factors that influences the customer to buy a pair of shoe.